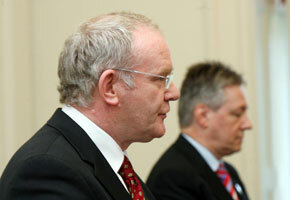 MARTIN McGUINNESS, joint First Minister in the North’s Executive, made one of the keynote addresses to this year’s Sinn Féin Ard Fheis. The political situation in the Six Counties is still “a battle a day” and Martin re-emphasised that the reunification of Ireland is not just a political imperative but is now – more than ever – an economic imperative. We reprint a slightly edited version of his speech. THE Ard Fheis allows us the opportunity to review our work over the past year, to recommit ourselves to our republican ideals, to our work and plans for the achievement of our primary political objective – the peaceful reunification of our country. Much has changed across Ireland, across Europe and indeed globally since we last came together. Economic downturn is the new catchphrase. Barack Obama is now in the White House – and he carries our hopes and good wishes. I first met the new President seven years ago, at a St. Patrick’s Day parade on the South side of Chicago, and the man who introduced us, said then that the young Senator was destined for the top. How right he was. Last year, Ian Paisley, who finally said ‘Yes’ to sharing power with republicans within the architecture laid out in the Good Friday Agreement, has moved from the stage. That he and I had the ability to work together in a civil and progressive way gives the people of Ireland an important glimpse of what the future holds for us. In Peter Robinson we have a new partner in leading the Northern Executive. However, this transition has not been smooth or certain as we sought to bring an understanding to the new DUP leadership of what it meant to be in a partnership government. The Executive did not meet for a number of months. I was very upfront with Mr Robinson — I made it crystal clear that the institutions could only work on the basis of partnership and equality or they would not work at all. Ian Paisley once famously said he was a plain-speaking Ulsterman. We now need that same plain speaking from the new DUP leadership both in the public domain and more importantly within the privacy of their own party meetings. There is no logic to the DUP on one hand telling us, as they repeatedly do, that they accept and have bought into the partnership required for these institutions to work, and then on the other to publicly call for a voluntary coalition, which in essence means unionist majority rule. As a plain-speaking Derryman, let me say that unionist majority rule is gone and gone forever. Like apartheid in South Africa, it is consigned to the dustbin of history. It cannot and will not be resuscitated and the DUP leadership know this and know it well. That section within their party who do not agree with the Good Friday institutions, preserved by the St Andrew’s Agreement, need to hear it loud and clear from their leaders that the old days and old ways are gone and gone forever. Until that happens there is always going to be tension when this level of denial meets the reality of confident and able republicans leading departments and the providing leadership at the Executive and the all-Ireland Ministerial Council. But that period was about something much more fundamental it was about defending the principle of partnership government and power sharing in the new political dispensation. It was about the acceptance of the rights and entitlements of nationalists and republicans won over many years of tough negotiations. It was about winning recognition that the destinies of all in Ireland, north and south are interlinked and interdependent. And it is telling, that throughout that period when Sinn Féin should have been supported, the SDLP sat on the sidelines, griped and huffed. It is now important that the outworking of the agreement between Sinn Féin and the DUP is speedily implemented. Sinn Féin is committed to partnership government. Sinn Féin is committed to all-Ireland government. We are committed to delivering change in the here and now, for the local communities who elect each and every one of us, for people across the North, for everyone across the island. One of the big issues currently being delivered on is the issue of policing. We alone set the transfer of powers on policing and justice as a priority for a number of reasons. The removal of powers from London and into the hands of locally-elected politicians is a crucial part of ensuring democratic accountability over policing. People want the police service and the judicial system equipped with the laws to tackle criminals and thugs. People want local politicians passing laws to tackle these issues as well as the issues of repeat offenders and bail, violent crime, anti-social behaviour, street drinking, and much more. The claims of a lack of confidence within the unionist community are bogus. Public confidence exists now for transfer to take place. For generations the RUC – and therefore policing – was the preserve of unionism. No longer. And I commend the republicans who over the past two years have stepped forward and begun the task of critically engaging with policing structures in the North, holding the PSNI to account and importantly shaping the future of policing with the needs of communities first. But policing was just one battleground to our struggle to promote equality and power sharing. These issues run across policing and justice but they are crucial in creating and sharing wealth. As we face the ongoing economic crisis, no section of our communities can be left behind, and we must create sustainable economic development. No doubt much of the political agenda in the coming year will be dominated by the global economic crisis. And rightly so. Ordinary people up and down this island are struggling. In the Executive we have already set building the economy and safeguarding the most vulnerable in our society as a priority. We were at the forefront of developing direct payments to those living in fuel poverty. We are currently fast-tracking capital spending projects of £1.4bn this year to help stimulate the economy and we have delivered significant investment from the US. The Celtic Tiger has given its last roar, brought down by a combination of obscene greed and corrupt bankers in a cosy relationship with a political elite who now believe that the way out of the current crisis is to penalise the elderly, the young and those whose labour built the wealth in the first place. Our commitment is to do all we can to protect those in poverty, the unemployed, those young people burdened by massive mortgage debt. It is time for new thinking. The argument for a strong, equal and resilient economy across our island is irrefutable. In the North, some politicians advocate a shared future whilst, at the same time, ignoring the damage partition does to our economy and our people. We have the nonsense of economic competition for investments in economies where the border is a disincentive to investment. The current economic crisis does not recognise manufactured artificial boundaries or borders and we should not let a provincial or partitionist mindset of groups, North or South, stall our project for reunification. Partitionism is the past, it was a failure and it has held back all our peoples. There is the sustainable way forward: a single economic unit, with harmonisation of tax and fiscal policies allied with a joint strategy to safeguard investment and employment throughout Ireland and an end to the waste of two health, educational, policing and other systems. For those who supported and promoted national division for sectoral interest the message is simple: we can simply no longer afford partition. Its continued existence inhibits our economy, and encourages sectarian divisions, discrimination and inequality. There is a peaceful and democratic path available to a united Ireland. That is what all this is about. But we all know we will not simply wake up in the morning and the British Government will have done the right thing. The British Government will only leave Ireland when the Irish people – together – demand that they leave Ireland. Our job is to popularise republicanism; our job is to ensure that the political institutions deliver for all of the people; our job is to engage with unionists to prove that unity is in the interests of all the people and our job is to mobilise the Irish diaspora across the world behind the demand for Irish unity. During my lifetime I have been a republican on the streets of Derry, I have been a republican peace negotiator in Dublin, Downing Street and Washington – and I am now a republican minister. The reason why I did all of this was because of my absolute belief that the reunification of Ireland is in the best interests of all of the people of this island. I believe it is right, it is just and it will happen.